Ford facilities in Chennai, India, Chonqing, China and Camcari, Brazil, reinforcing the strategic role of Thailand as a volume production and export hub in the region. The Thai-built models will be for domestic sale and export to markets across the ASEAN region. The all-new EcoSport will eventually be sold in 100 markets worldwide. 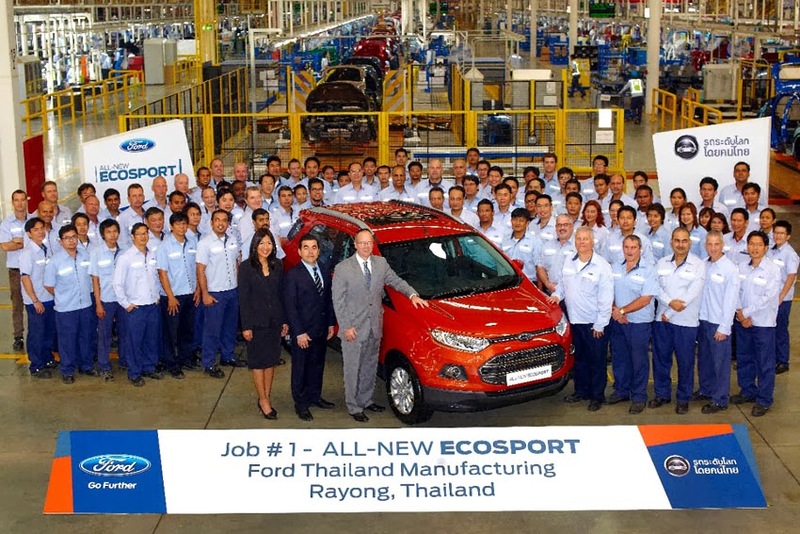 "The all-new EcoSport continues our ongoing product-led transformation by providing customers with another segment-leading vehicle to our growing Ford showroom across our ASEAN markets," said Matt Bradley, President, Ford ASEAN. "Produced at our highly flexible Ford Thailand Manufacturing facility, it is the next proof point in our continued growth strategy in the region," he added. "Based on Ford's global B-segment platform, the EcoSport urban SUV will appeal to people with a strong streak of independence who love exploring the world at large," said Yukontorn 'Vickie' Wisadkosin, MD, Ford Thailand. "Combining small-car practicality with the agility of a SUV, it delivers a segment-leading package of quality, safety, fuel-economy and value." "The all-new EcoSport will confidently create its own space in a highly attractive and very practical vehicle segment," added Yukontorn.